When you think that there is no ‘Perfect Birthday Cake,’ check out our mouth-melting cakes that are served for the special occasions like Birthdays. We make both the ready-made and custom cakes to make your day even more enjoyable. Inspired by the food lovers like you, Ganache Patisserie launched to fulfill your desire for the lovely cakes, puddings, cupcakes, muffins, cookies, pastries, doughnuts, croissant, and chocolates. As the best cake shop in Vadodara, we know the trend, and that’s why we offer a wide range of fresh fruit flavors too. We are also providing personalized designer cakes in Vadodara. 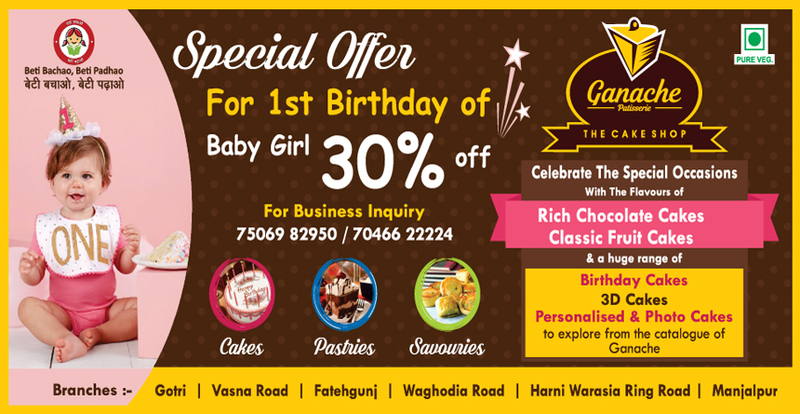 If you want the best birthday cake in Vadodara or nearby places, then visit your nearby Ganache Patisserie branch. We make hygiene and quality cakes from fresh ingredients only. We never compromise with the quality standards, and that’s why we offer a 100% money back guarantee if any of our product is not as per the hygienic standards. Apart from the birthday cakes, we also provide custom-made cupcakes for the occasions like Anniversary, New Year, Christmas, Wedding, Diwali, and other Parties in and around Vadodara. If you want the birthday decoration items like posters, candles, balloons, etc. then you can visit our shop. Ganache Patisserie is the place where you will say only one thing .. WOW!! !